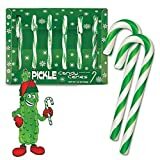 If you're a picky eater who's not down with peppermint candy canes, then perhaps you would prefer a more comfort food-like flavor with these cool new yet quite disturbing Mac and Cheese Candy Canes. Yep, yellow candy canes that taste like instant macaroni and cheese now exist to make the holidays a bit more festive and tasty. Maybe. Perfect for stocking stuffers, gift exchanges, and all mac and cheese lovers who have always wished for it to be made into cane-shaped candy. Please don't put ketchup on them before eating. Reserve for special occasions like when you serve the creamy mac and cheese!